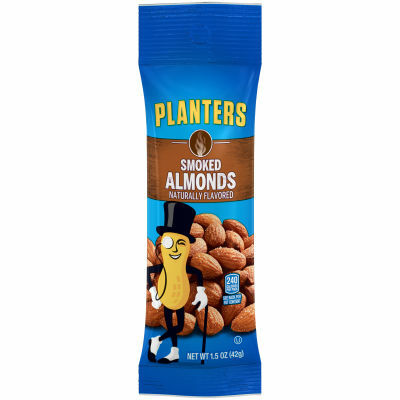 Planters Smoked & Salted Almonds - Planters Smoked & Salted Almonds are perfectly smoked & salted with pure sea salt. snacking doesn’t have to be complicated or boring anymore! Munch on these scrumptious almonds and satisfy your snack cravings in the most exciting way possible. |Happy snacking! - |Savory Nutritious Snack! - Smoked & salted almonds are just perfect to fix snack emergencies. Bursting with nutrition & delectable flavor along with crunchy, smoky texture, these snacks are a must have to nibble on, in order to satiate the craving that strikes in between meals.You can add these almonds to your salads to add some flavorful crunch.